Native only to the United States, the Greater Prairie Chicken prefers the long grass prairies of the central regions of North America. 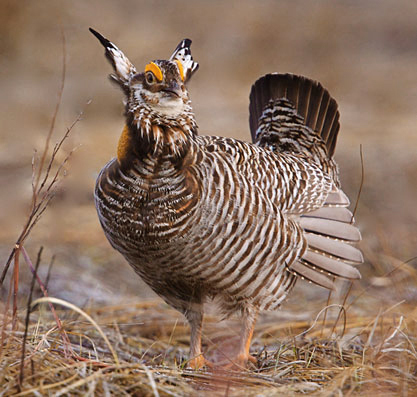 Although its population is vulnerable, Greater Prairie Chicken populations have been stable and according to the North American Breeding Bird Surveys has increased since 1966 to a current population of around 400,000. The Greater Prairie Chicken is a large bird weighing as much as 3 pounds, slightly larger than a ringneck pheasant. Fearless in flight, they are unique amongst upland birds that, as a group, refuse to challenge predatory birds in flight. Prairie chickens readily take to the air, regardless of the threat. Extraordinary flyers, chickens fly as much as 30 miles to go to and from food sources to roosting sites. Veracious eaters, Chicken rely mostly on insects in their first 16 weeks of life to provide the protein necessary for growth. During the fall months, the primary food sources change from insects to plant based foods. It’s during this transition that bird dog competition comes to the long grass prairie for the annual National Amateur Prairie Chicken Shooting Dog Championship. 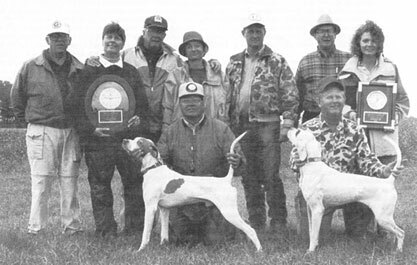 In 1990 a small group of wild bird dog enthusiasts led by Dr. George Ihrke were awarded the National Amateur Prairie Chicken Shooting Dog Championship after having hosted successful annual one-hour classics. Since its first running this Championship has consistently been one of the best-attended championships for the AFTCA. All 26 annual Championships have been held on the Buena Vista Grasslands near Wisconsin Rapids, Wisconsin. This challenging venue has provided a consistent population of Greater Prairie Chickens on all of its six one-hour courses. Complementing the Amateur Championship, this venue also annually hosts the National Open Prairie Chicken Shooting Dog Championship, bringing together both Amateur and Professional Competitors on consecutive trials to kick off the beginning of the field trial season. This championship is held in late September. Increasing the challenge is the formidable cover made up of wet heavy long grasses combined with unpredictable weather that can vary from hot, humid late summer patterns to early winter snow. Each of the 6 courses makes in excess of 1,000 acres available to hunt on. Many of the competitors have spent the summer months preparing themselves on the lighter, drier and sparser grasses of the western prairies. The sudden heaviness of the venue’s soils and grasses combined with a jumpy and very unpredictable bird makes this Championship one of the most exciting and challenging to compete for. Things happen very quickly and without warning at this venue. A strong, seasoned and wily wild bird dog is an extremely valued competitor for this event. The inaugural running of the event was held on September 15th 1992 in which 34 pointers and 9 setters competed under the judicial team of Mr. Tom Honecker and Mr. C. W. Shelton. During this 4-day events 272 Prairie Chicken were moved on the 6 courses. Named winner was Ann and Dr. George Ihrke’s pointer male Tyler Too handled by Dr. Ihrke. Runner-Up was awarded to pointer male Condo Koolaid owned and handled by J. W. Erwin.